Early July 2006. San Jose's very attractive mission style station. 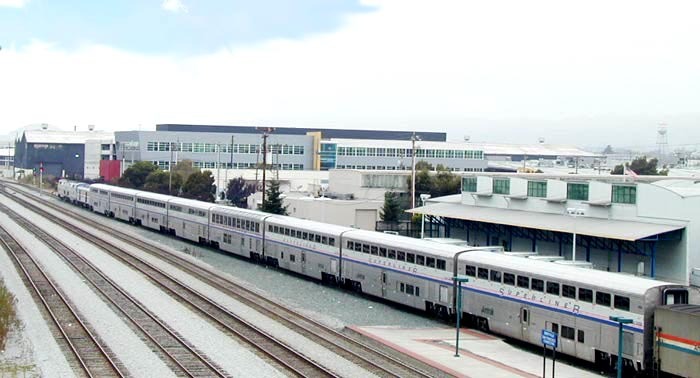 On the left the Caltrain local from San Francisco on which I rode, and on the right a Capitol Corridor train soon to leave for Sacramento, which I would ride as far as Berkeley. The Bay Area is getting quite a rail network, with increased frequencies on the Cap Corridor line, the Altamont Express (out of action when I was there due to forest fires), and the relatively fast new 'Baby Bullets' on the Caltrain line. Stations and right of way have been rebuilt and all in all it's a pretty user friendly and efficient operation. I do have a bone to pick with the Amtrak service (funded by California). There was no signage of any kind in the San Jose station to let departing Amtrak passengers know which gate their train would be leaving from (plenty of signage for Caltrain), and the public address system was so horrific that we could not hear instructions. Needless to say, there was unnecessary and utterly inexcusable confusion, particularly since the ticket office closed twenty mintues before traintime and stayed closed for a good ten minutes. Why does the customer often come last in the Amtrak information equation? Is anyone minding the store in San Jose? And, once on board I was disappointed to hear from an employee that there was talk of ending food and beverage service, one of the most pleasant aspects of Cap Corridor trains. But frequencies are increasing and Northern California is truly a passenger train hotspot. There's lots of consumer pressure and reason to be optimistic that kinks will get worked out. It's a day or so before 9/11/00 and here's the California Zephyr departing from Emeryville, California, for its journey to Chicago. I remember a gleaming train with a full complement of coaches, sleepers, dining car and high-level lounge-observation (seen here in the middle of the train) that would feature a guide to describe the great history and scenery that would be enjoyed through the autumnal Sierras. There were movies in the evening and space for kids to play. In my mind, this was the apex of CZ service. Soon the windows would be unwashed, and the train would begin its slow descent into Union Pacific delays, some of which are now of several hours duration. I recall good food in the diner, almost always including one or two 'chef's choices'. Now it's pre-fab food, served on plastic plates after much of it is reheated in microwaves. Gone is prime rib, great steaks, bacon and eggs and wonderful Amtrak french toast with bacon. The bean counters in Congress have joined the anti-long distance crowd in the Administration to slowly but surely degrade the travel experience and soon there will no longer be separate lounge and dining cars in the rush to save money and eliminate crew. The movies will soon be gone and the play area of kids is history. Most of the little touches that made first-class service enjoyable are gone. Hopefully, as gas prices fluctuate between high and abysmally high, the population ages, airline service continues to degrade and consumer groups with political clout swing into action, wiser heads will prevail. But in the meantime those who support long-distance service should keep those cards and letters flowing to their representatives in Congress. CLICK HERE to see photos from Ron's 40 years of CZ photography. What with Amtrak's collection of troubles it's good to have some very good news. 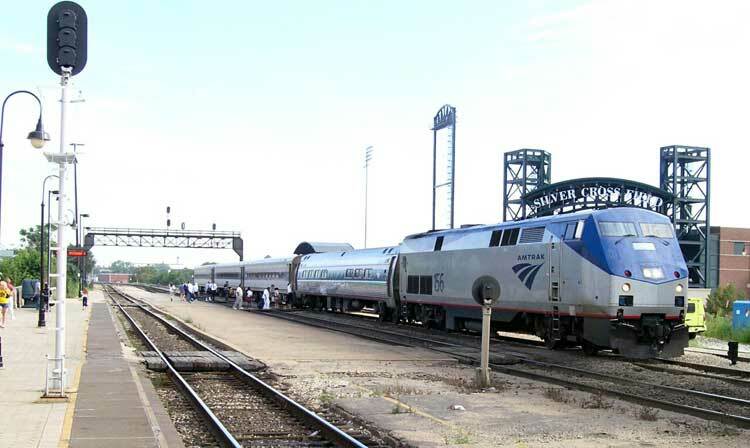 Soon the Ann Rutledge, pictured in Joliet on its way from Chicago to St. Louis (and then Kansas City) in August, 2005, will have new company -- two round trip trains each day on the St. Louis run. Five daily round trips will come close to making this a real corridor. Other good news in Illiniois includes new trains on the Carbondale and Quincy routes, and politicians who coughed up the $24 million for the new trains are now talking about reviving other routes. 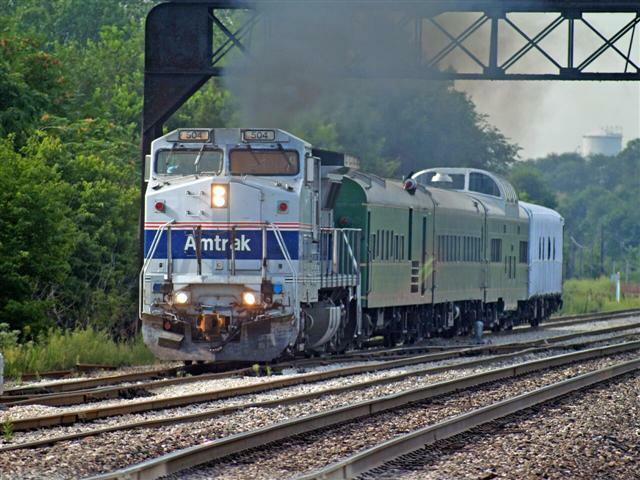 Illinois joins funders of the Downeaster, and myriad routes in California in thickening the Amtrak timetable to add new trains. Now lets hope other states get the message. Oh, and that DOT and other fed Amtrak enemies get the message that people want and need passenger trains. Changes last made on: October 21, 2006.